Make my Holiday : A Good Old Fashioned Art Swap! 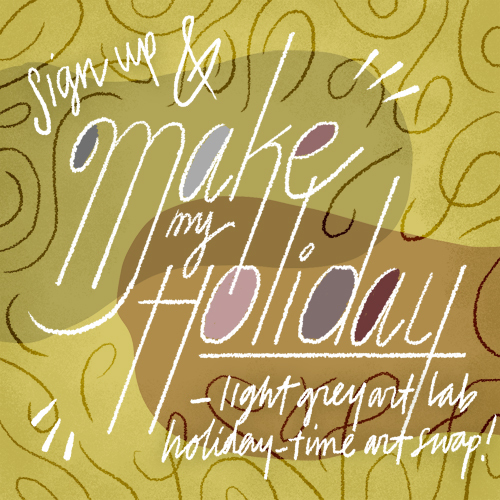 Light Grey is coordinating a good old fashioned art swap for the holidays! UPDATE! 11/16/12-- Thanks to everyone that submitted to be part of the swap! We're going to be announcing your pairs in a moment! The submissions are now closed! Watch for the list momentarily! Do you want to give and receive something really super-special in the mail for the holidays? Would you like to make a great art friend in the process? Leave a comment with your name and email below before Thursday November 15th and we'll pair you up another awesome creative person for (what we hope) will be a very memorable gift exchange! Once everyone's names are added below, Jenny and I will pair people at random and publish a new list on Friday November 16th that has everyone accounted for. Then, all you have to do is find your person on the list, request their postal-mail address, and make something to send them via postal mail by Friday, December 7th! There are only a couple rules to participate. 2. The thing you send has to be made by you. It doesn't matter when you made it, how you made it, why you made it, or where you made it. Size doesn't matter. Shape doesn't matter. As long as you did it, that's perfect! 3. Once you're paired, it'll be up to you to request your partner's postal address. 4. Please be sure to send your packages out by Friday December 7th so everyone receives their packages before the holidays are over! 5. (Optional, but we would love you forever) Once you receive your package, please send us a photo of you with what you got from your swap-friend! We'd love to hear form you and we'd love to post a public thank you / show and tell from everyone involved over the weeks people receive things! We'll post a batch every week as long as we are getting photos! *** Seriously, everyone. It has been so amazing getting to know you guys over the last eight months (whether that was through a show, class, online or otherwise). It's been great seeing everyone talk with each other and get to know one another by collaborating. Here's to some local-to-long distance hugs. From us to you. Help us make this art swap a big, awesome, happy success. :) Here's to the holidays and a happy new year!